Since Father Eric Augenstein became archdiocesan vocations director in 2013, he’s made a point to visit Catholic high schools across central and southern Indiana on a regular basis. It’s a key setting for him to help people discern God’s call in their lives because high school students are at an age when they often give serious thought to their future. “It’s important to let young people in our Church know who they can talk to if they want to have more conversations about a vocation, that they know that there is a vocations office, that there is a vocations director,” Father Augenstein said. 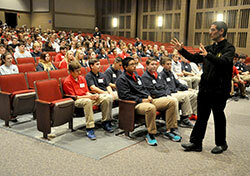 And he has been in contact with a growing number of high school students interested in learning more about vocations. Four new seminarians for the archdiocese this year are graduates of Bishop Chatard and Roncalli high schools, both in Indianapolis, and Our Lady of Providence Jr./Sr. High School in Clarksville. One of the new seminarians is Matthew Long, a 2015 Roncalli graduate who is now a freshman at Bishop Simon Bruté College Seminary and at Marian University, both in Indianapolis. 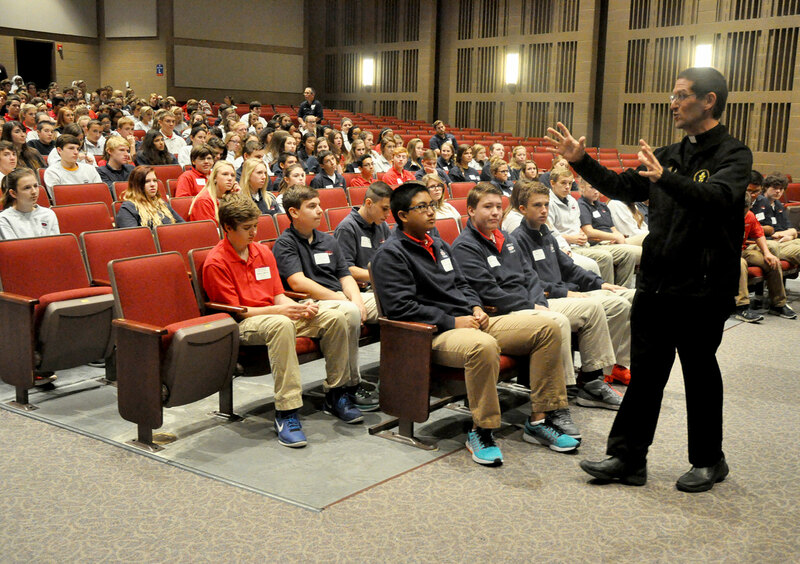 On Oct. 28, he participated in a vocations day for freshman at Roncalli in which archdiocesan priests, religious priests, seminarians and religious sisters spoke with the high school students about their vocations. Although Long noted there wasn’t such a vocations day at Roncalli when he was a student there, he said that his experience at the high school—especially a class specifically on vocations during his senior year—was “a big part” of his vocational discernment. To further classroom exploration of vocations, the archdiocesan vocations office has made resources available to schools and parishes across central and southern Indiana that will help young people learn about the ways that God calls people to serve the Church and the world. The vocations curriculum was developed by the Valdosta, Ga.-based Vianney Vocations. It is adaptable for kindergarten through 12th grade and usable both in schools and parish religious education programs. Its resources—including lesson plans, activities, prayers, videos and art—can be accessed and used online. Many also can be printed. The presence of priests and religious sisters in Catholic high schools across the archdiocese also helps young people consider God’s call in their lives. Benedictine Sister Kathleen Yeadon, who teaches seniors in social justice and Scripture classes at Bishop Chatard, sees this happen on a daily basis. “I use every topic as a springboard for a discernment. In social justice, each student choses a cause to research and work on throughout the first quarter,” said Sister Kathleen, a member of Our Lady of Grace Monastery in Beech Grove. “I explain how God calls us through the interests we have. In sacred Scripture, many of the Old Testament stories [teach] the class on how discernment works. Quenton Wellington, a senior at Bishop Chatard, appreciates the witness that Sister Kathleen gives to him and his classmates. As faith formation director at Father Michael Shawe Jr./Sr. High School in Madison, Chemaign Drumm helps sophomores, juniors and seniors learn about and be open to the vocation God has planned for them. The class on vocations that Matthew Long took at Roncalli as a senior helped him slow down and listen to God’s call. He hopes the increasing effort at his alma mater will mean more young people discerning priestly or religious vocations in the future.